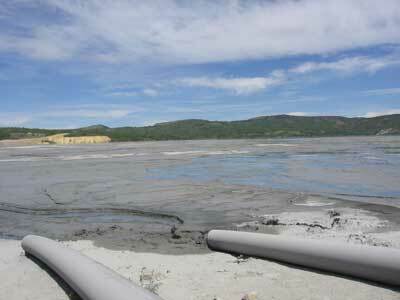 Water from two different underground areas, or aquifers, affects the Berkeley Pit. 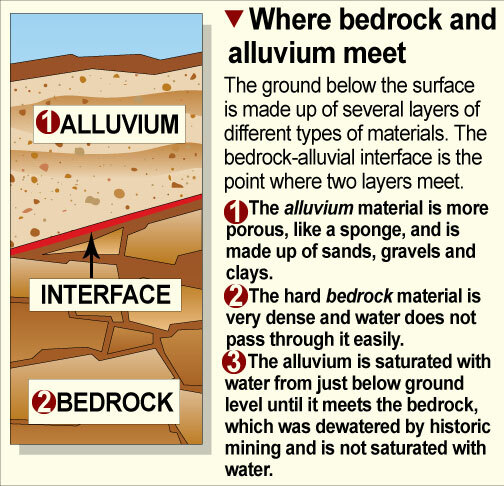 The illustration above illustrates the difference between these aquifers, the alluvium and bedrock. Aquifers are places where water is found in permeable rocks and soils underground. The area around the Berkeley Pit contains two main underground aquifers – the alluvial aquifer and the bedrock aquifer. The alluvial aquifer is closer to the surface. Water flows freely through the layer of ground called the alluvium, a porous mixture of sands, gravels, and clays. Near the east wall of the Pit, the alluvium is saturated with water from this aquifer. 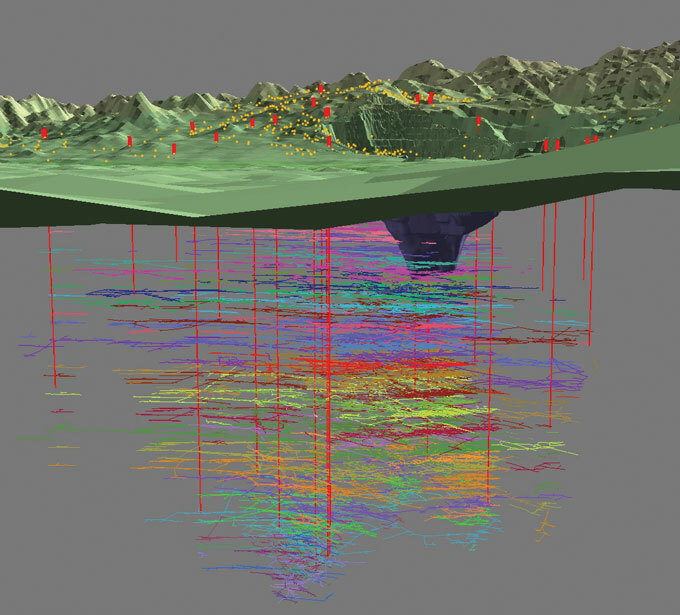 This image from the Montana Bureau of Mines & Geology illustrates the connections between historic underground mining tunnels and the Berkeley Pit. After groundwater pumping ceased in 1982, the tunnels, and eventually the Pit, began to fill with water. The bedrock aquifer runs deep below the ground. It is a “confined aquifer” trapped within fractured bedrock which water cannot easily pass through. In areas adjacent to historic mining activities, this aquifer was dewatered by large pumps located underground to allow for underground mining. Up to 5,000 gallons of water per minute were pumped from the underground mines to allow for mining, including the Berkeley Pit. The large stainless steel pumps located underground in the Kelley Mine were turned off in 1982, and since that time the dewatered area has been filling back up. These two aquifers are independent systems, separated by a thick layer of clay-rich weathered bedrock that hinders water from the alluvial aquifer from seeping down into the bedrock aquifer. Instead, water from both aquifers is flowing toward the Pit because it is the lowest spot in the area. 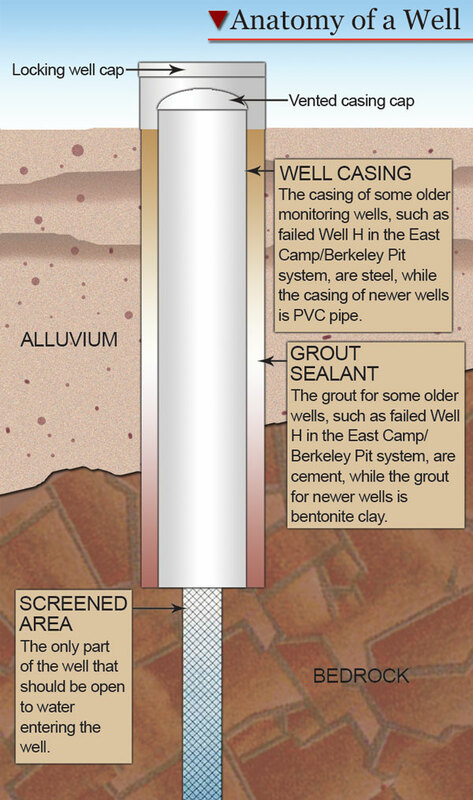 The workings of a typical monitoring well in the Berkeley Pit system are shown in the illustration above. Click on the image to view a larger version. Monitoring wells installed throughout the area are used to closely track the water levels and the water quality of both aquifers. Since monitoring began, the alluvial aquifer has remained fairly constant, fluctuating only a few feet here and there depending on seasonal precipitation. In contrast, the water levels of the bedrock aquifer in areas of historic dewatering have been steadily rising to pre-mining levels. Water levels in the bedrock system have risen hundreds of feet and show minimal seasonal trends. The monitoring wells also allow scientists to measure the pressure differential between the two aquifers, expressed in pounds per square inch, or psi.